SOURCE GUARDIAN: RBS accused of pushing small businesses to the edge to boost profitsCity regulators have been handed a dossier of evidence compiled by an adviser to Vince Cable which claims that Royal Bank of Scotland was deliberately wrecking viable small businesses to make profits for the bailed out bank. Cable, the business secretary – a long-time critic of the banking industry's lending practices – said some of the allegations were so serious that he had handed the report, compiled by businessman Lawrence Tomlinson, to the regulators and the bank. 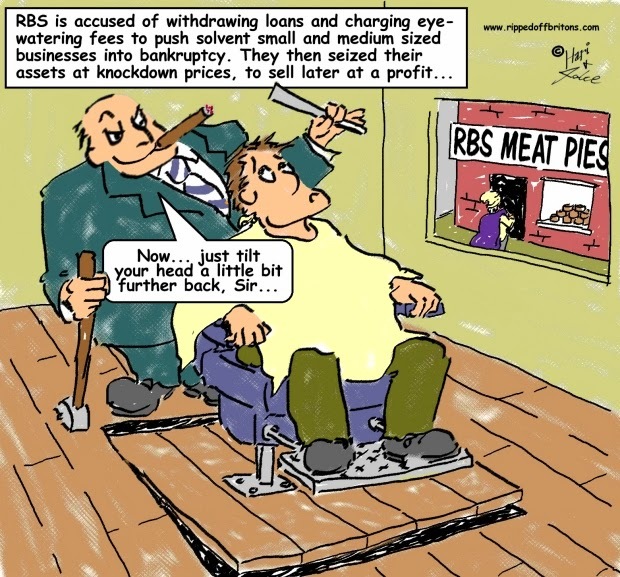 Did Royal Bank of Scotland seize assets of small business debtors and sell them, well below true value, to its subsidiary? Graphs at a glance: Government wants you to think we made a profit on sale of Lloyds Bank shares. Actually we made a thumping loss!